Six decades of musical theatre wizardry has brought Stephen Sondheim unmatched success. His eight Tony Awards beat Gershwin, Porter, Berlin and Hammerstein. Now, Main Street Theatre & Dance Alliance, led by Director Jacqueline Lucid-Cusick, is bringing a curated collection of his songs, Sondheim on Sondheim, to Roosevelt Island. That distinction makes Sondheim on Sondheim, first performed on Broadway in 2010, unique to musical theatre. Composer of music and usually lyrics for shows from West Side Story through Gypsy, Company, A Funny Thing Happened on the Way to the Forum and Sweeney Todd to Sunday in the Park with George, Sondheim weaves a long trail of memorable music. This production takes a different slant. To accompany taped interviews with Sondheim, the songs — curated by James Lapine — are drawn from 19 shows, including student shows, and along with well-known and not so well-known numbers, there are even lyrics that were cut. 11 of those voices are Roosevelt Islanders. Russ Cusick tackles Sondheim’s musical and lyrical representation of Seurat’s pointillist paintings in Finishing the Hat from Sunday in the Park with George, and Kathleen Weeks takes on the emotionally touching In Buddy’s Eyes from Follies. 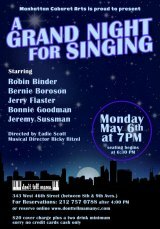 Eric B. Cohen tackles my favorite Sondheim song, Being Alive, the closing anthem from Company. Cusick is preparing the ensemble for four performances: March 31st at 8:00 p.m., April 1st at 2:00 p.m. and 8:00 p.m., and April 2nd at 7:00 p.m.
Plan a date. We will let you know where you can get tickets as soon as they become available.